Get latest version of SWF to Picture Converter. SWF to Image Converter original name is Aoao SWF to GIF Converter, it's a easy-to-use application for convert SWF to JPEG, GIF, BMP,PNG, TGA images. 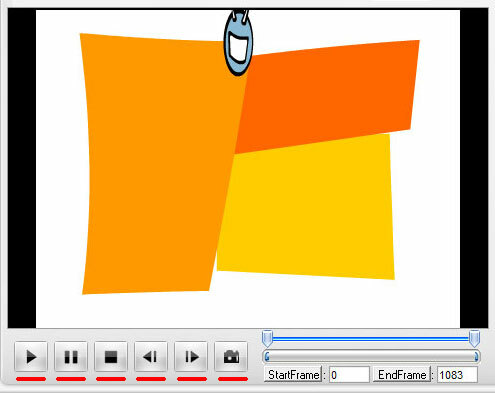 SWF to Image Converter will keep SWF's animation show an take it to images. GIF is a best way for put your animated information on web page, you want to display thumbnail for every SWF in your application or on your web-site. If so then SWF to Image Converter is exactly what you are looking for. It can take SWF file and convert it into images. SWF to Image is an excellent program developed by AoaoPhoto Digital Studio. This program will enable you to convert SWF files to animated image, which is smaller in terms of file size. The program is perfect for users who wish to convert their Adobe Flash SWF animations into animated GIF images, which can be viewed without the need of a Flash player or plug-ins. Another feature provide more then 10 effects for you. SWF to Image Converter support windows all and all popular image formats, the program is really worth downloading it. How to convert SWF to image with Aoao SWF to GIF Converter? If you are never used Aoao SWF to GIF Converter, please download it at: https://www.aoaophoto.com/products/swf-to-gif.exe. This is shareware list price $29.90, now time limited discount price is $19.90, please seize the chance to purchase full version. Unregistered version will put words "Unregistered version" on output image. Let us to start convert swf to animated gif. 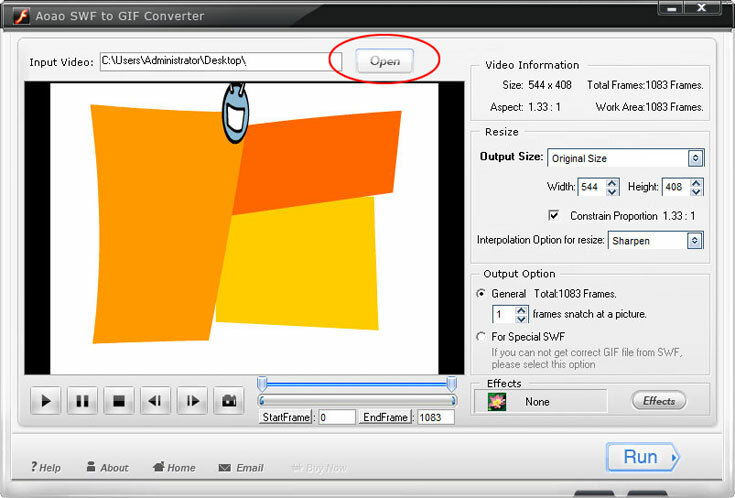 Step 1: Launch Aoao SWF to GIF Converter, add you swf file by clicking "Open" button. Step 2: With the swf preview window, you can do some actions like Play, Pause, Stop, previous frame, next frame and capture picture. Step 3: Select part of swf which you want to converting to animated gif. Step 4: Specially good effect available during the swf to gif converting process. Step 5: Some necessary option on the output interface. a. Choose a output folder. b. Choose a output image format. c. Output image quality setting. After these parameters has been completed, click "Run" button to start conversion process. This process will take tens of seconds. 1. The unregistered version of SWF to GIF Converter will put words "Unregistered verion" on output picture.